Dance Commentary by Heather Desaulniers: "The Escapement"
Katharine Hawthorne’s newest dance work, “The Escapement”, premiered over the weekend at Joe Goode Annex in San Francisco’s Mission District. Hawthorne, an up-and-coming choreographic talent, has a special knack for fusing scientific processes and movement in contemporary performance. “The Escapement” added yet another distinct chapter to this growing body of work; with a fresh subject matter, time. While the subtitle of the piece, ‘a danced history of timekeeping’, suggests a chronological approach to the topic, “The Escapement” is more comprehensive; a work that includes literal and figurative representations of time, as well as an examination of its external and internal qualities. The fifty-five minute composition began in a bare space – no set, just a taped yellow circle in the center of the room, from which movement would radiate like spokes of a wheel, or more accurately, like a clock. Hawthorne injected the notion of time right from the start with smartly subtle details. When movement is too ‘on the nose’, dance can turn into simplistic gestural mime; it just doesn’t work. “The Escapement” didn’t hit the audience over the head with its foundational concept; its balance was very good. 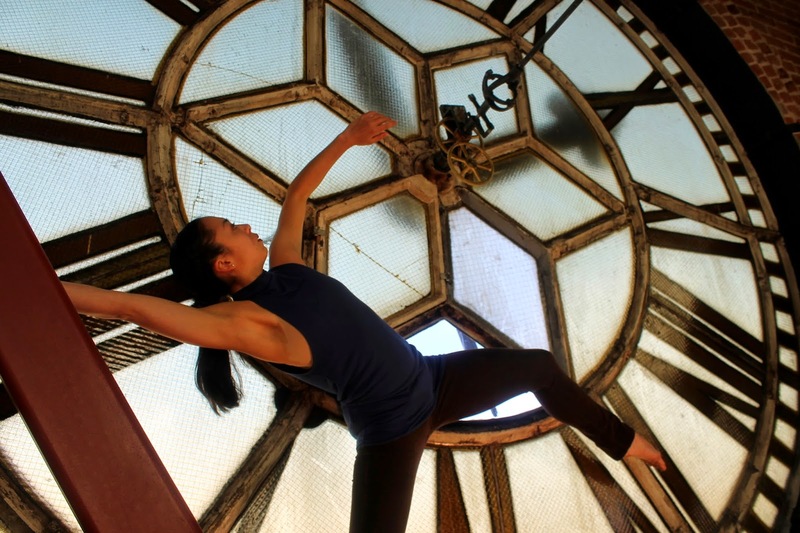 An external example of time was present in a recurring clock motif - while the dancer or dancers rotated on the spot, one arm was outstretched from the shoulder. For an internal and structural characterization of time, Hawthorne created a beautiful canon sequence mid-way through “The Escapement”. The cast stood in a line and cycled through a single movement phrase, each beginning the steps a few beats after the dancer in front of them. Small reflexive movements in the shoulders, legs and arms mimicked time’s smallest elements (seconds) while simultaneously revealing the individual’s own body rhythms. Repetitive solo sequences were layered together as the dancers scattered through the space. These various physical phrases looped concurrently as with the constant yet distinct nature of time. And toward the end of the dance, there was also a genius collection of ‘mechanics’ vignettes - the entire cast (four women and one man) came together like the gears of a watch or clock in scenes of collaborative and accumulated motion. “The Escapement” is full of these clever and well-formulated moments. However, the work is still in the early stages of life (it will have another run in the fall at ODC Theater) and some further exploration may prove helpful. First is the lighting. Mobile lights are used throughout the work, operated by the dancers. While the lights seemed to have a significant importance, their connection to and with the choreography was not clear. In addition, “The Escapement” is filled with an over abundance of running sequences, where the cast moves in and out of the main stage space. This broke up the cohesiveness of the work and added unnecessary freneticism. And last was the overall sense and feel of the dance. Saturday evening’s cast was a group of talented artists, very capable of communicating the material and totally committed to their performance; they have bright futures as modern dancers. But they are young. And a youthful cast certainly gives “The Escapement” a particular look. That’s not necessarily a good or a bad thing, but it is an observation that needs to be considered.